• The timing of the snowstorm expected Saturday has time-shifted a bit later, and is now expected by the National Weather Service to begin Saturday morning, not Friday night. It’s looking like the snowfall totals on the East End will be higher than early models suggested. The National Weather Service has issued a Blizzard Watch and is predicting possible totals between 5 and 11 inches in Riverhead. Four to 8 inches are expected in Greenport and Montauk is expected to see 2 to 5 inches of snow. Winds across the East End are expected to gust up to nearly 50 miles per hour throughout the storm, which is expected to begin just before noon Saturday and continue through the night. Our full story is online here. • In the meantime, today will be sunny, with a high near 36 degrees and wind chill values between 15 and 25. We have a northwest wind blowing 10 to 16 miles per hour. Tonight will be mostly clear, with a low around 17. Tomorrow will be mostly sunny, with a high near 32 degrees but wind chill values between 10 and 20. The high temperature Saturday is expected to be 35 degrees, but it will feel quite a bit colder under the blustery blizzard conditions. • The League of Women Voters of the Hamptons is hosting a candidate debate between Richard Yastrzemski and Julie Lofstad for the seat on the Southampton Town Board vacated by Brad Bender tonight at 7 p.m. at the Westhampton Free Library. All are welcome to attend. The election is next Tuesday, Jan. 26. • Now is the time to wake up early and have a look out at the southern sky. Mercury, Venus, Mars, Jupiter and Saturn can all be seen stretched across the southern sky simultaneously before dawn beginning yesterday, and they’ll remain visible before dawn until Feb. 20. 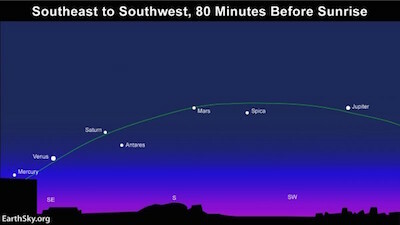 The last time all five visible planets appeared in the same sky together was in the winter of 2004 to 2005. • The Riverhead Town Board will discuss the funding of a highway department building, the town’s 225th Anniversary, accident reports and a merger of the town’s senior and recreation departments at their 10 a.m. work session this morning. Their full agenda is online here. • The East Hampton Town Board will hold a public hearing on the Frizone Community Preservation Fund acquisition and amendments to their urban renewal lot map at their 6:30 p.m. meeting tonight. Their full agenda is online here.